Tsutomu Seki was born in Kochi City, Japan, in 1930. He has discovered and co-discovered six comets between 1961 and 1970. He has also rediscovered 28 periodic comets. His interest in comet searching all started in 1948 when he read about Comet Honda-Mrkos-Pajdusakova. In 1950 he began searching for comets from his home and found Comet Crommelin in 1956. However, ten years of dedication and efforts to discover new comets had passed without success and in disappointment he decided to halt comet hunting temporarily in 1959. After serious soul searching, he resumed his comet search, this time, armed with better equipment, more knowledge on comets and a new search method. On October 11, 1961, he discovered his first comet, Comet Seki, after 12 long years of hard work and dedication. In the following year he discovered another comet, which was named Comet Seki-Lines. 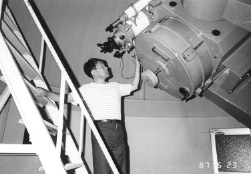 His discovery of new comets continued: Ikeya-Seki in 1965; Seki 2, 1967; Ikeya-Seki 2, 1967; and Suzuki-Sato-Seki in 1970. In 1973, he changed his observing site to a new location in Geisei Village and directed his efforts to astrometric observations of comets, orbital calculations, retrieving periodic comets, and a search for asteroids at the newly established Geisei Observatory. In these areas, too, he has proved himself to be a prolific observer with a tremendous success. Interestingly, he still hunts comets whenever possible with smaller telescopes after completing his nightly observing routines with the observatory's 60cm telescope. As expected of an observer of his stature, he has a long list of awards received from astronomical and non-astronomical organizations in recognition of his contributions to the discovery of comets. He received awards from Astronomical Society of Japan, Oriental Astronomical Association, Astronomical Society of the Pacific, and Astronomical Association of France. He has also received awards from Kochi Prefectural Government, Kochi Newspaper Company, and Kochi Cultural and Education Association for his contribution to local culture through his publications and educational activity. 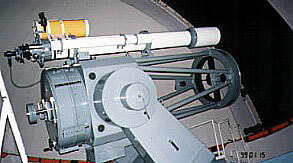 His life-long interest and devotion is not limited to astronomy. He is an accomplished classical guitarist and also an able athlete who regularly participates in Japanese Masters Games. He is also a gifted writer with several books published, some of which received prestigious literary awards. Currently he is the director of Geisei Observatory, Kochi, Japan, and head of the Comet Section of Oriental Astronomical Association. June 1966. 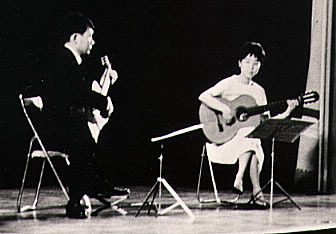 A duet on stage with his wife. Copyright (C) 2002 Tsutomu Seki.